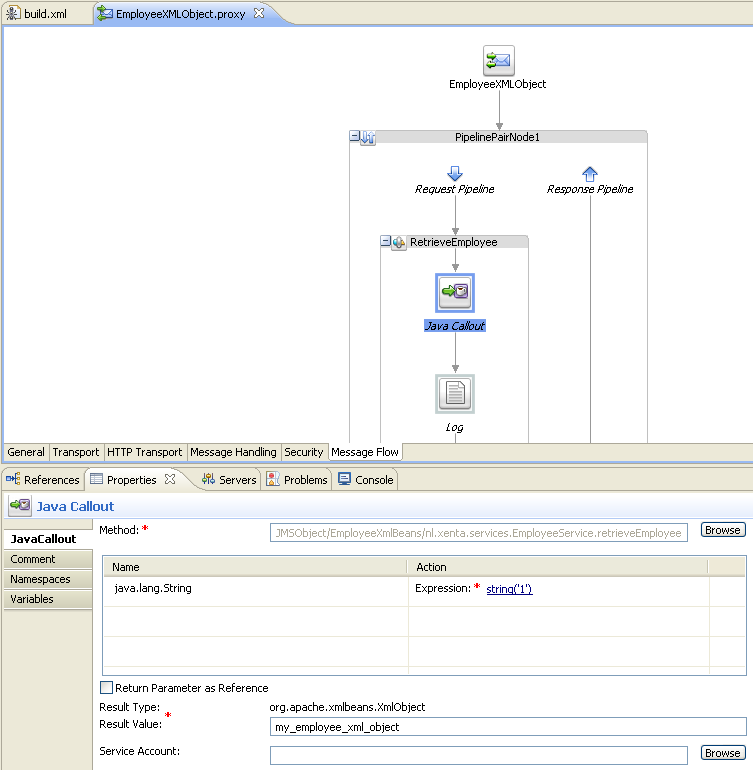 A few releases back Oracle enhanced to JMS transport to be able to handle Java Objects in queues and topic. 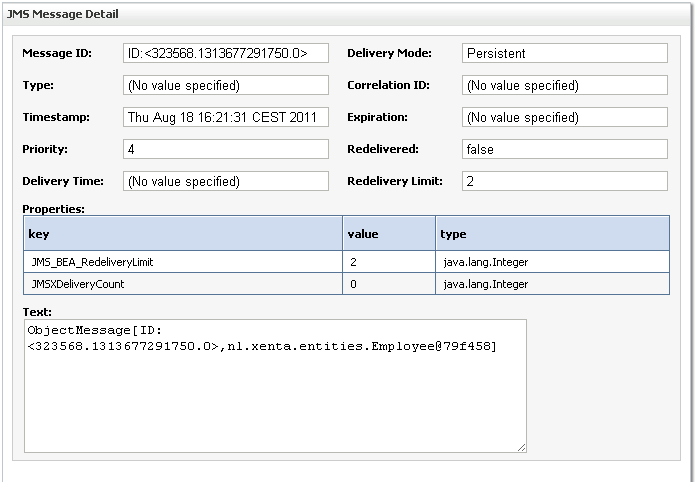 The JMS transport now has the option to either receive Java Objects in the OSB processes by retrieving them from a topic or queue, or storing the plain Java Objects. First we need to create a new queue in Weblogic, in my case QueueuIn. Build it and generate a jar file from it. 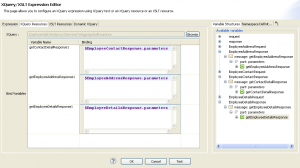 Execute the jms java client to create Employee object and store it on the QueueIn queue. Go to the Weblogic Console to see if the message arrived in the QueueIn queue. 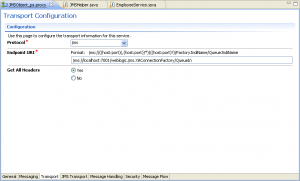 Restart Weblogic and try viewing the message in the console again. Great, it worked. Now we can see a Employee object is stored in the queue. Let’s go on with the OSB part. First copy the jar created in step 2 to our OSB project. Configure the Client Jar and browse to the jar file generated in step 2. Create the Message Flow as defined in the picture and only add a log activity, which logs the body. 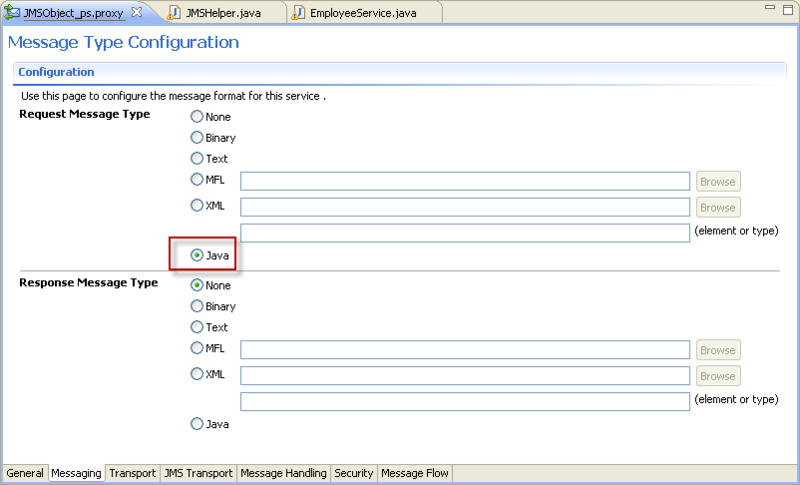 Deploy the process and use the JmsHelper client to create an Employee object and send it to the queue. The proxy service will poll, get it out of the queue and basically does nothing with it except logging the body. After the message is send, check the osb domain log file to see what’s in the $body variable. 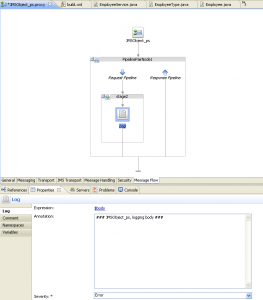 The java object is retrieved from the queue and processed by the proxy service. But when we look in the body we don’t see any ‘actual’ payload, only a java ref to the java object itself. Let’s use a few java callouts to see how we can use the content of the java object. Extend the java project from step1. 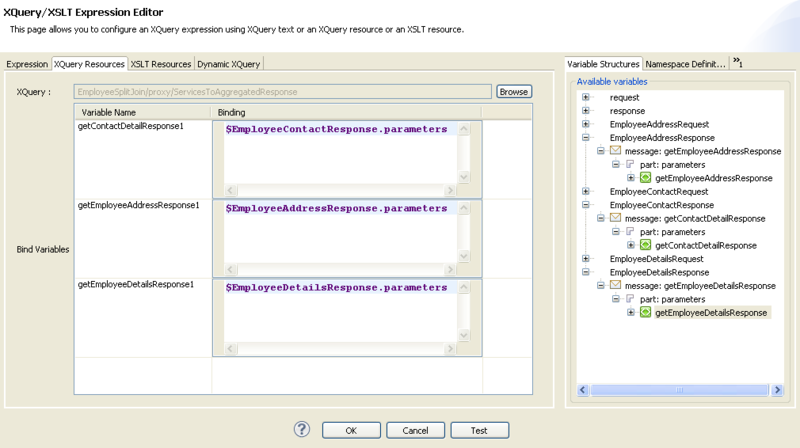 The input Employee object will be the data from the queue and as response we just return the string value of the object. Generate a jar archive from it and store it in your OSB project. 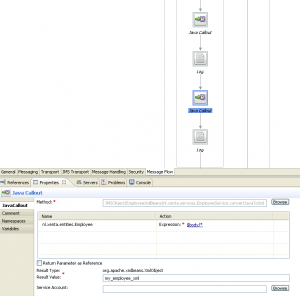 Add the java callout to your proxy service message flow and after it add the log activity. The log activity will just log the value of $my_string_response. 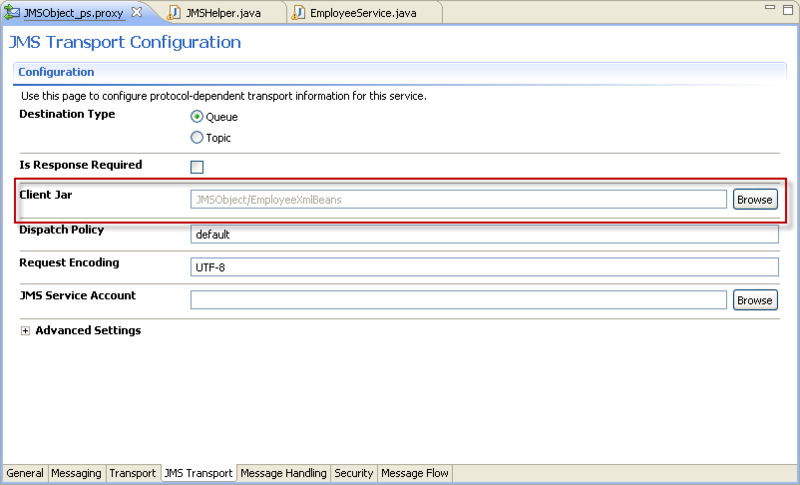 Now trigger the process again by sending a message with the JmsHelper client and check the osb log file. Read this for some extra information about the java callouts and their input and return types. In this example we get a String returned, so we can just retrieve the value of it in the message flow without sending it to another java callout. For this example i made a copy of the Employee object and named it Person. 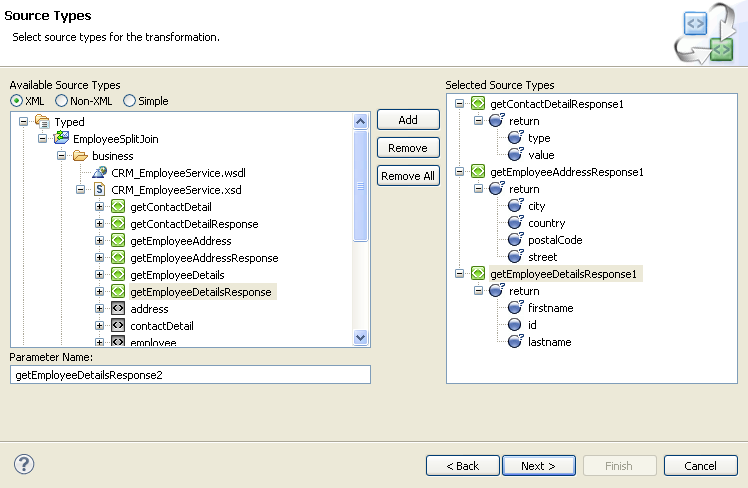 We will use the same Employee object as example1 for the input and return a Person object back to OSB and log this. And again we get a java ref back, only this time a new ref id to a new object. To be able to ‘use’ this object we can either send it to a new java callout or publish it to another queue. See this blog on how to send the java object to a java callout and return a XmlObject back. I added the XMLBeans resources (build.xml and libs) to the same project as mentioned in step1. For this testcase we used the next method. It will receive the Employee object from the queue and return the xml(object) representation of it back to the OSB. Run the ant build script again and copy the jar to our OSB project. In this jar we will find the Employee and Person entities, the generated XMLBeans artifacts and the static methods used for the java callout. I guess we could have splitted some of those in other archives, but for the simplicity of this article it’s fine like this. The jar we used in the other cases won’t be needed anymore since all we need is in this new one. Don’t forget to edit the proxyservice and change the Client Jar to the new jar. With this final testcase we’re able to retrieve the java object from the queue, convert it to a xml representation and send it back to the proxy service. 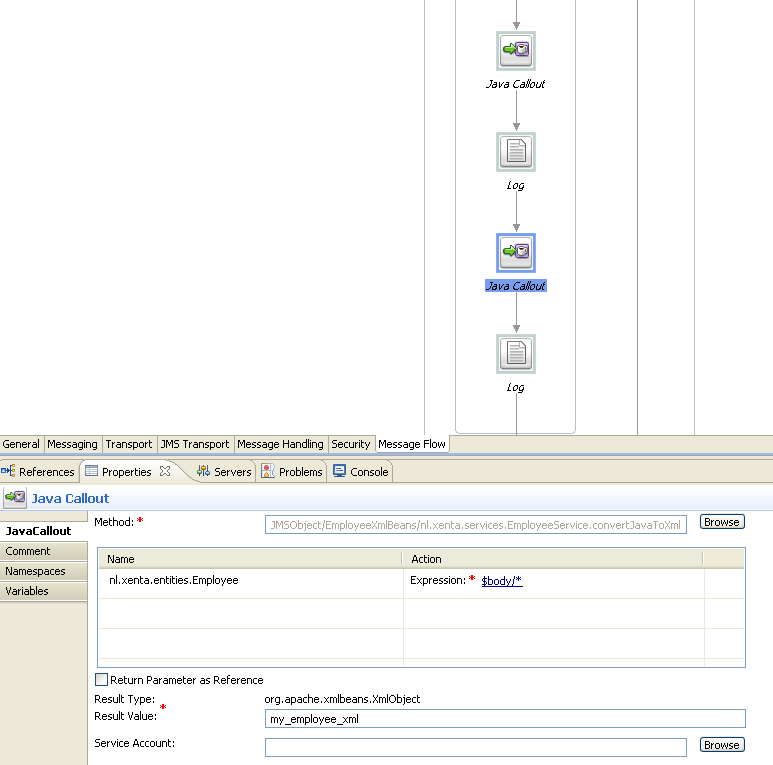 In the message flow we’re now able to retrieve data from it by use of some xpath expression. 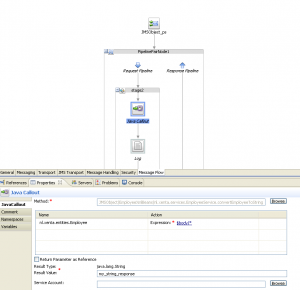 One of the patterns mentioned on the eai patterns site is the so called Aggregator pattern. We will be using this pattern in our next use case. On the Oracle Service Bus we will implement the EmployeeService with an operation called ‘getEmployee’. On the Oracle Service Bus we want to supply our clients 1 interface to be able to retrieve Employee information. The interface definition will define Employee details, addresses and contact details. Every system invocation will be a synchronous call and will get a response back from every one of them. After having received the last of the 3 responses the parallel invocation is done. In the process flow we now need to aggregate the responses and transform these into one response which will get routed back to the client caller. 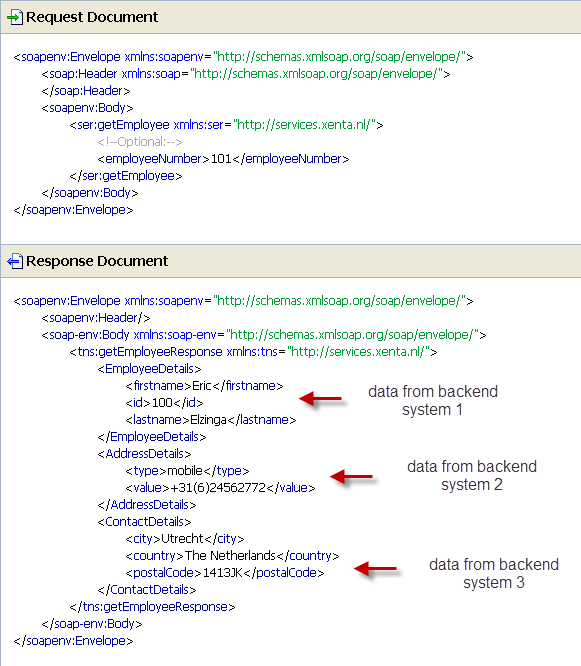 The client caller will not know what backend systems will get invoked to retrieve data. 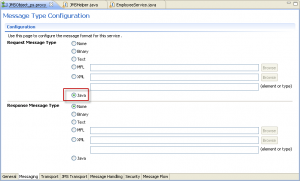 It will only receive one message response according to our defined interface on the service bus. Enough talk, let’s see what we need in the Oracle Service Bus to implement this. In a real world situation we could have 3 different backend systems which will all supply diffent parts of the Employee data object. For our case we will use just 1 webservice with different operations which will get invoked as different services. 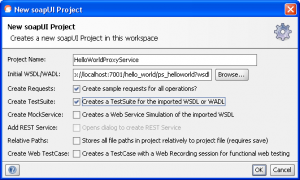 Create a new Webservice project in Eclipse and add a new webservice to see. The simulated backend systems are ready to supply data. We need to next list of resources in the Oracle Service Bus to be able to implement the process. Since we have just 1 webservice representing all the third parties we don’t really need to create separate business services for every party. To simulate the real scenario we still create 3 separate business services, all based on the same wsdl, but in the routing we will just use different operations. 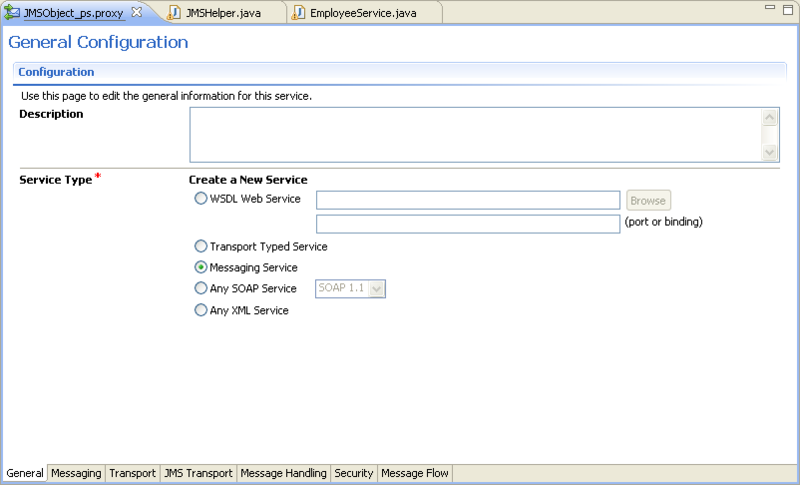 So create the next set of business services all based on the same EmployeeService wsdl (which we imported in the step before). Create a new wsdl for the interface of the split-join. This wsdl will only represent the getEmployee operation. Name the wsdl CRM_EmployeeService.wsdl. 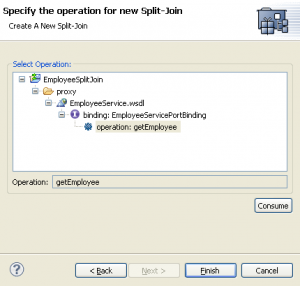 Create a new split join (File | New | Split-Join) and name it EmployeeSplitJoin. By default it will generate for us the variables request and response. Add a Parallel activity between Receive and Reply. Add an extra Branch to the Parallel activity. In every Scope and a Invoke Service activity. 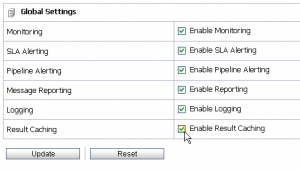 Select the first Invoke Service in the first Scope and configure it. On the Operation tab, browse to the first business service, AddressDetails. 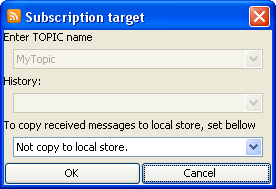 On the Input Variable tab, select for Message Variable the option Create Message Variable. 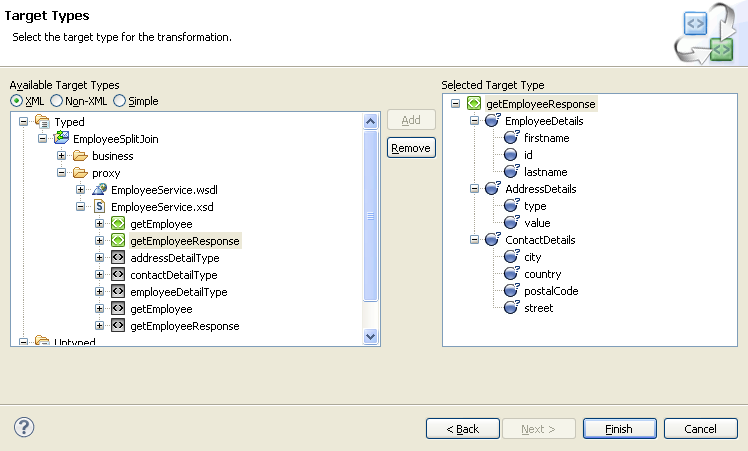 Do the same for the Output Variable tab and name the variable EmployeeAddressResponse. 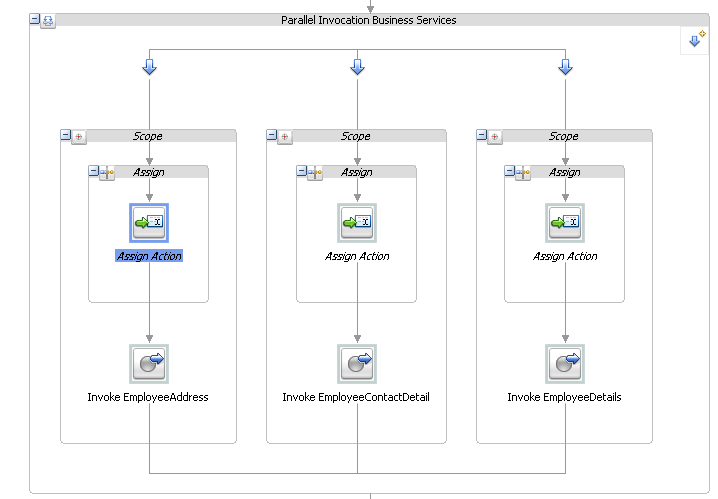 In every Scope add an assign before every Invoke Service activity. With these assigns we’re mapping the inputparameter of our process (employeeNumber) to the input of our business service (backend service). Repeat these steps (add scope, add assign, add invoke service, configure input/output of invoke service) for every invocation of our business services. We should end up with the next set of branches. The parallel invocation of our backend services is ready. Now we need to aggregate the responses of all the services. 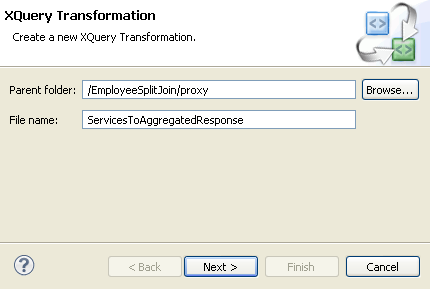 Create a new xquery transformation which will receive 3 inputparameters, one for every response of our backend service. The result of the transformation will be a message according to our proxy service interface (getEmployee). After the Parallel activity add an Assign. 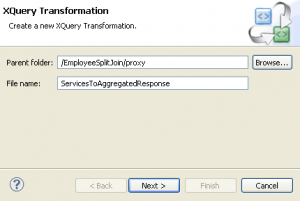 Click the expression and go to the XQuery Resources tab and browse to the ServicesToAggregatedResponse xquery. Bind all the input parameters as defined in the image below. For the Variable select response.parameters. To be able the call the split-join flow we need to generate a business out of it. 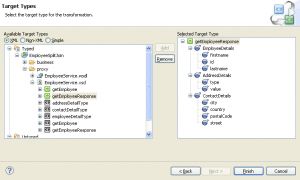 Right click on the EmployeeSplitJoin.flow and go to File | Oracle Service Bus | Generate Business Service, name it EmployeeSplitJoin. 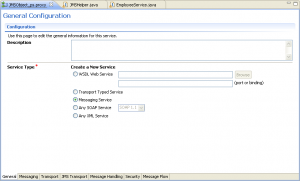 Create a new http soap proxy service based on the CRM_EmployeeService wsdl. 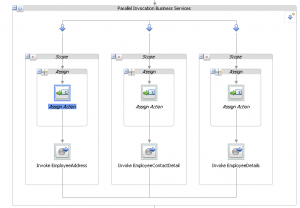 In the proxyservice route to the ‘EmployeeSplitJoin’ business service. Since the interface of our split-join is the same as our proxy service (same wsdl) we can just use the passthrough, no transformation is needed. Instead of using the split-join we can also use several service call outs in our process. Downside on this approach is all the invokes will be waiting on each other to come back with response (sequential). 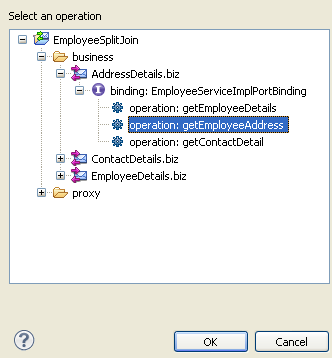 With the split-join approach we can parallel invoke all the services an aggregate the results. In case of services which need to give a low response time and still need to retrieve data from multiple backend systems we can’t model the flow with sequential invocations, split-join would then be an approach to take. Besides that static split-join i used for my case we can also use the dynamic apporach in which we loop over reoccuring elements in the payload, process them parallel an aggregate the results. Edwin showed this approach in his blog. For our current adf project we’re generating webservice proxy clients against the wsdls of our OSB services. The object contains both an id-element and an id-attribute. Error creating model from wsdl “file:/EmployeeService.wsdl”: The following location is relevant to the above errorProperty “Id” is already defined. Use to resolve this conflict. JAXB tries to generate the java representation of this schema and will (try to) generate a java class in which it will generate 2 variables with the name of ‘id’. The wizard also comes with the solution on how we could implement the fix for this. We added a few things. With this property we can force jaxb to generate a variable idElement instead of the id-element. So no duplicates on variable-name will get generated. No duplicates in variables, since it generated idElement and id. Oracle Service Bus has a feature now for a while which gives us the option to switch on Result Caching on services. Result Caching is based on Oracle Coherence, an in-memory data grid. Basically what it does is cache the results from the calls to the business services. Which means on a second call to the service, OSB will first verify if the data, identified by a xpath-expression is in the cache. If it is, i will be retrieved from the cache, if it isn’t the call to the physical endpoint of the service will be made. To be able to identify the data in the cache you need to configure the result caching on the business service, add the identifying ‘Cache Token Expression (XPath)’ and configure the expiration of the data item in the cache. This one can be handled by the default of the OSB, based on a duration or based on a XPath expression on the request/response message. For a good overview read this part of the Administrators Guide. For this scenario we re-used the almighty Hello World Webservice again. Our testscenario is ready, let’s get on. To be able to verify if the result cache is getting used or not we need to enable Monitoring on our proxy and business service. 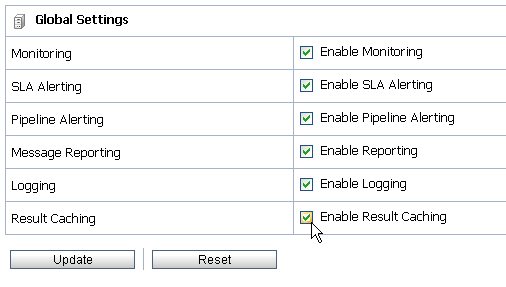 Or enable the monitoring after deployment in the SBConsole. By default we haven’t enabled the Result Cache. So when we would call the proxy service it will passthrough to the business service and do the ‘real’ call to the webservice. When we repeat this, every time again, the proxy service will just do the ‘real’ call to the webservice	over and over again. 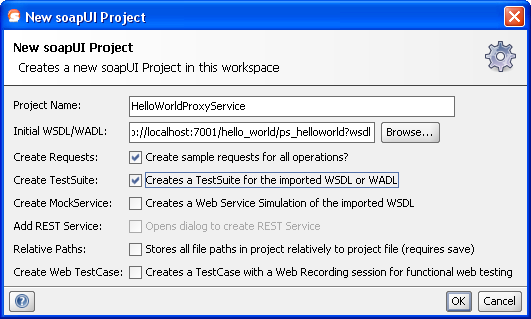 Create a new SoapUI project, based on the wsdl endpoint of our OSB proxy service. Enable the creating of the TestSuite too. 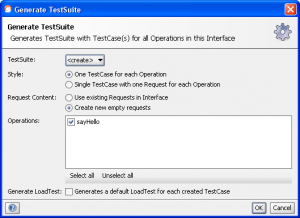 Create a new TestSuite and enable the ‘Generate LoadTest’ option. Double click the LoadTest 1, and check a few settings. Our simple loadtest is ready. Based on 1 thread it will fire off 20 requests to our proxy service which eventually will invoke our Hello World business service. Oracle Service Bus service statistics. By enabling the Monitoring on our services Oracle Service Bus will collect and and gives us a Statistics overview in the console of the service. Go to the Service Bus Console > Operations. Select the ‘Service Health’ tab at the top. 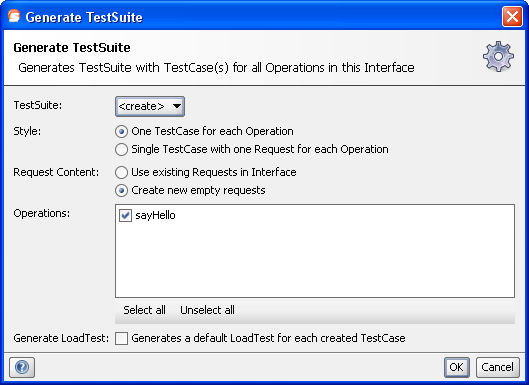 Go back to SoapUI and change the request payload of our sayHello teststep. 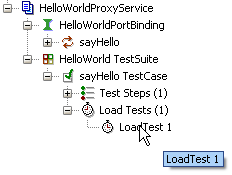 .. and the results of the loadtest, 20 calls to the proxy service. Now go back to the SBConsole and look at the statistics again. Both the proxy service and the business service received 20 messages, like we expected since we haven’t done anything yet with result caching. 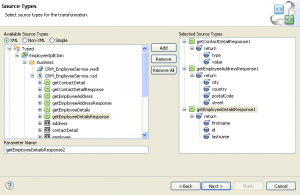 We can enable the Result Caching on the business service either in Eclipse or in the Console. Since we need to add some XPath expressions it’s easier to do it in Eclipse itself. Open the business service and go to the ‘Message Handling’ tab. By enabling this configuration we setup the next situation. Result Caching is active, when ever a request arrives through a proxy service to the business service result caching will get triggered. It retrieves that data by use of the XPath expression and check if it’s already or still availabe in the cache. If the data isn’t available in the cache, the data will get stored in the cache and the real call to the webservice will be done. If the data is available in the cache, the data will get retrieved from the cache and there won’t be any call to the webservice. Eventually the retrieved data will be returned to the response pipe of the proxy service, back to the client caller. Deploy the osb project and go back the SBConsole, to the Statistics. First we need to reset the statistics to see the difference on the numbers between the situation in which we didn’t use the result caching. Go back to the SoapUI project and start the loadtest again. And for the last time go back the SBConsole to the statistics. Again 20 messages arrived at the proxy service. On the first call the data won’t be in the cache so the ‘real’ call to the webservice will be done. The next call will contain the same message payload (since we’re using the same message in our SoapUI test), so the XPath expression will evaluate to true, which means the data can be retrieved from the cache. And this continues till message #20. So eventually from the 20 calls we made to the proxy service, only 1 will really do the webservice call at the backend, and the other 19 calls will retrieve data from the cache. I hope it’s a bit clear now how the result caching works in the Oracle Service Bus, how to configure it and eventually how to be able to see if the cache is really active. 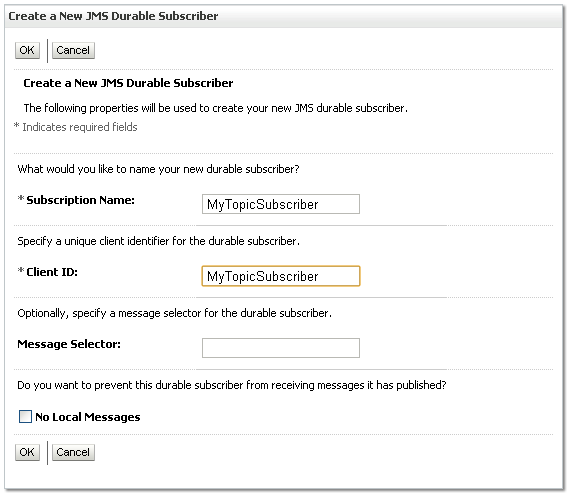 Besides using the Weblogic Console to add subscribers (durable) to our topics we can also use QBrowser to browse queues and topics on your Weblogic Server. Download the tool here, configurate the .bat/.sh so all the correct versions of the jar are included or create the Weblogic Full Client (http://download.oracle.com/docs/cd/E12840_01/wls/docs103/client/t3.html). Connect to your Weblogic instance. You will get an overview of all your queues and topic, and also our MyTopic. Click on the topic to add a subscription to the topic. We haven’t created a Local Store yet, so select the default ‘Not Copy to local store’, we will do that later on. Create a message on topic by your testclient (or in my case, my OSB process) and watch QBrowser again, to see the message coming in. So we’re able to add a subscriber on the topic to read the messages. 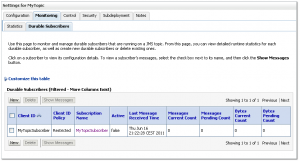 When we go back to the Weblogic Console and check the Durable Durable Subscribers tab, we still see only 1 subscriber, the one we created in this blog. QBrowser created a non-durable subscriber for us on the topic. Send again the message from the client and click ‘resume subscribe’. The just sended message isn’t stored in the topic. This because we used a non-durable subscriber on the topic, so in case of a disconnect the messages won’t get persisted. QBrowser also gives the option to define ‘Local Store’. Trigger your client again (or in my case the OSB process) to send a new message. 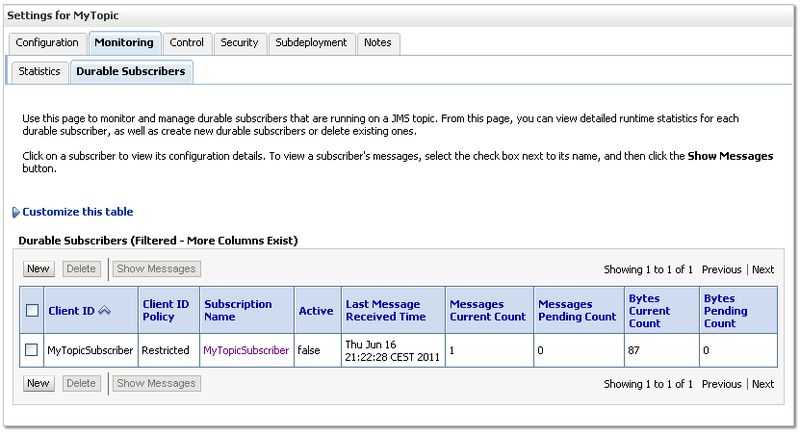 With this functionality you will be able to store all the incoming messages on the topic on filesystem. So far the short overview of the possibilities in QBrowser when using topics. For one of my testcases i implemented a simple process in the Oracle Service Bus which stores messages on a Weblogic topic. This blog will not contain any rocket science, just a quick overview on how to deal with topics and subscribers in Weblogic. To be able to look at the message available in a topic we need to first subscribe to the topic. By default there won’t be any subscribers available for our just created topic. No messages available in the topic. Durable topics are topics which persistence every incoming message for a durable consumer. Each durable consumer will receive his own copy of the mesage. We add a non-durable consumer on the topic. We send 10 messages to the topic, at message 5, we stop the non-durable subscriber and we continue sending the message till the last mesage. We add a durable subscriber on the topic. We send 10 messages to the topic, at message 5, we stop the durable subscriber and we continue sending the message till the last mesage. We start the non-durable consumer again. Now it will receive message all the persisted messages and the new incoming messages again. See this clear explanation on the Active MQ site about Durable queues and topic. 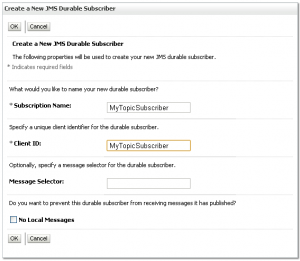 So the JMS Provider itself knows when using a durable topic subscription what its subscriber are identified by combination of ClientID and the durable subscriber name. It knows what messages got delivered and which aren’t. 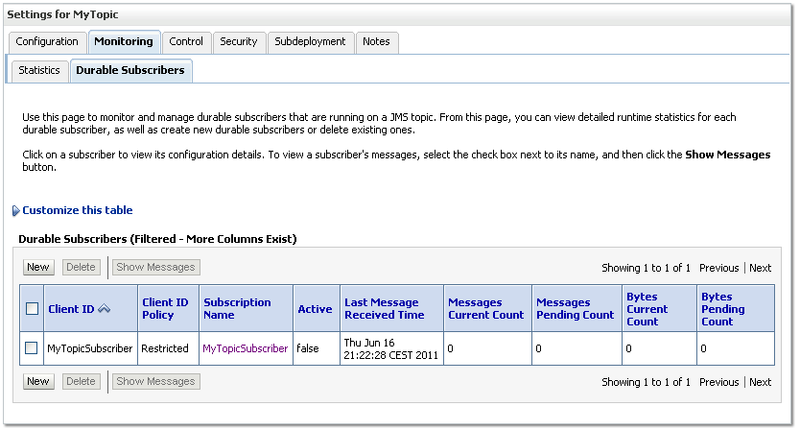 When the subscriber goes down the JMS providers knows which messages to keep available for the subscriber for delivery. The subscriber connects again and receives those messages. In case of a non-durable subscriber those messages would have been lost. Already read this book a while ago, but never had the time to do a short review on it. After reading ‘Oracle SOA Suite 11g R1 Developer’s Guide’ i was still hoping to read some new refreshing information. BPEL 2.0 is fairly new for me. Read about the specs, but never had much of a chance to get in touch with it for development purpose. The book mentions most of the “what’s new changes” spread around in several chapters in the book. I would rather have some sort of short overview in the book what mentions me what’s new in this version of BPEL, how did we do it in BPEL 1.0. Like this the reader will have a better overview of what BPEL 2.0 will give him for extra functionality. The ‘Oracle SOA Suite 11g R1 Developer’s Guide‘ book was more of a global overview book with not a lot of in-dept information. From this point of view this book gives use more in-dept information and more ‘advanced’ information about the possibilities of BPEL (1.0/2.0) in conjunction with the SOA Suite, so they’re both complementary. Since i have a strong background both on OSB en SOA Suite, i’m always looking for some sort of best practice on what to model in SOA Suite and what to model in the OSB. The authors added a nice chapter on the Oracle Service Bus and the use of the Oracle Registry. Too bad they didn’t add some extra information to the debat to decide where to technically implement which components of your business process. But i can imagine this would also be out of scope for this book. To finish off the book the authors give us 2 chapters to show the possiblities the Oracle products give us to connect BPEL with BPMN. Chapter 10 gives discusses the round-tripping of BPEL to BPMN and back by use of the BPA Suite product and the Oracle SOA Suite. 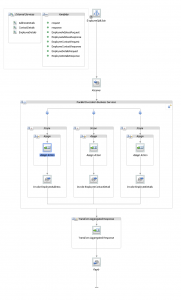 And chapter 11 shows us how to integrate the composite applications with BPMN processes by use of the BPM Suite. 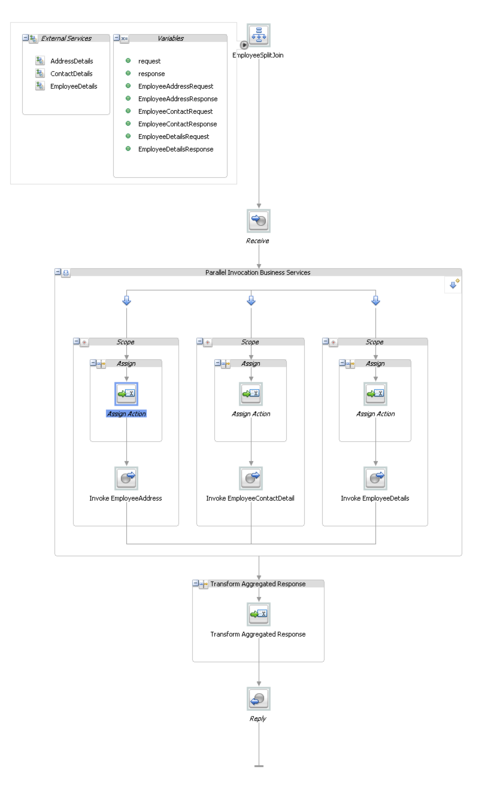 Again a well explained example, so the reader gets a good overview on the integration of the BPMN process into your composite. The first Chapter (Introduction to BPEL and SOA) gives us a overview of both concepts, which standards are available and are getting used in the products. 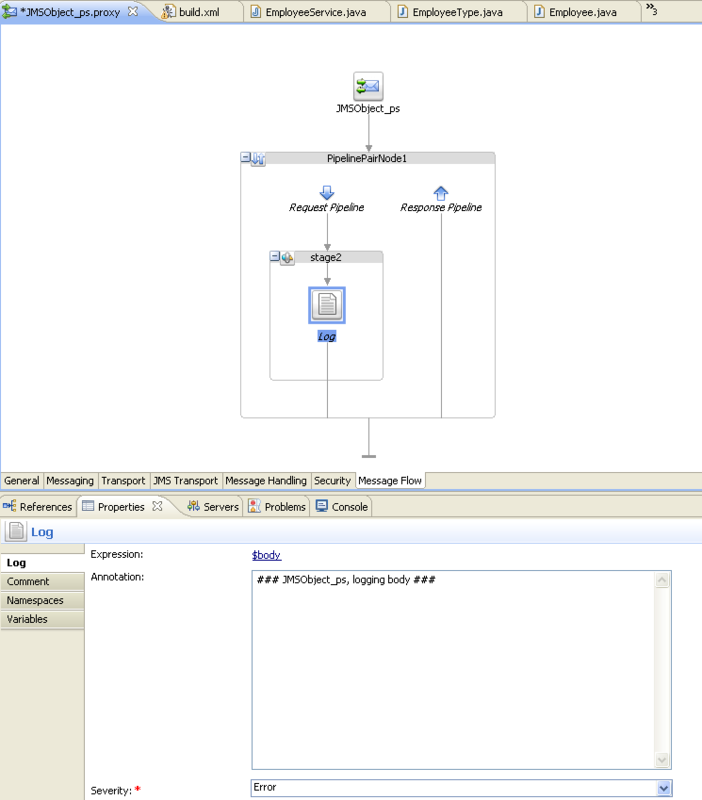 Chapter 2 (Service Composition with BPEL) starts with ‘beginners’ information about the available BPEL activities. The following chapters like (Advanced BPEL, BPEL Extensions, Entity Variables, Master Detail processes) will discuss the more advanced topics on BPEL (both activities defined by the standard and the oracle-specific implementations). Chapter 8 (Monitoring BPEL Processes with BAM), chapter 9 (BPEL with Oracle Service BUs and Service Registry) and the chapters 10 (BPMN to BPEL Round-tripping with BPA Suite and SOA Suite) en 11 (Integration BPEL with BPMN using BPM Suite) all discuss the intergration with other products of the Oracle portfolio. All well explained and with examples. So for the reader it’s nice to see how easily one can integrate with the other products. Overall it was a good read. It gave me a bit of advanced and in-dept information, good examples (easily to follow by just clicking what is mention in it). Looking at the title of the book i would expect more of the BPEL 2.0 part. It doesn’t get much highlighted in the book, although a lot of the new specs are mention through the whole book, so you really need to read the specs to see what is changed in the 2.0 definitons. Although i do just read the content of the ‘Appendix A’ on the Packt site (WS-BPEL 2.0 Syntax Reference), nice list of the available functions. A while back i also followed a 3day BPMN training on the Oracle BPMN Suite, so the BPMN chapters (especially the last one) were a nice rephrase on what we learned on the training. 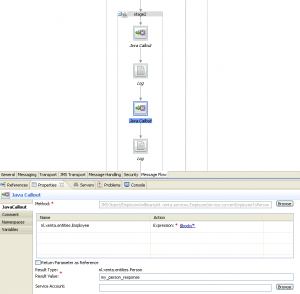 In our OSB services we make a lot of use of jca database adapters calling stored procedures. 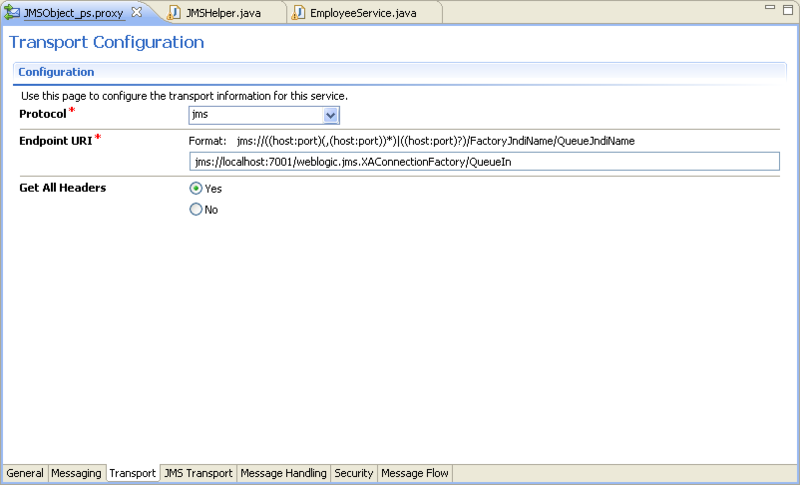 Invoke JCA outbound service failed with application error, exception: com.bea.wli.sb.transports.jca.JCATransportException: oracle.tip.adapter.sa.api.JCABindingException: oracle.tip.adapter.sa.impl.fw.ext.org.collaxa.thirdparty.apache.wsif.WSIFException: servicebus:/WSDL/EmailService/BusinessService/retrieveMail/retrieveMail [ retrieveMail retrieveMail_ptt::retrieveMail (InputParameters,OutputParameters) ] – WSIF JCA Execute of operation ‘retrieveMail’ failed due to: Fout bij oproep opgeslagen procedure. Fout bij een poging de EML.EMAIL.RETRIEVE_MAIL API voor te bereiden en uit te voeren. Er is een fout opgetreden bij het voorbereiden en uitvoeren van de EML.EMAIL.RETRIEVE_MAIL API. Oorzaak: java.sql.SQLSyntaxErrorException: ORA-00902: Ongeldig gegevenstype. Fout bij oproep opgeslagen procedure. Controleer of de API is gedefinieerd in de database en of de parameters overeenkomen met de handtekening van de API. Deze uitzondering wordt niet als opnieuw te proberen beschouwd, blijkbaar wegens een fout in het model. 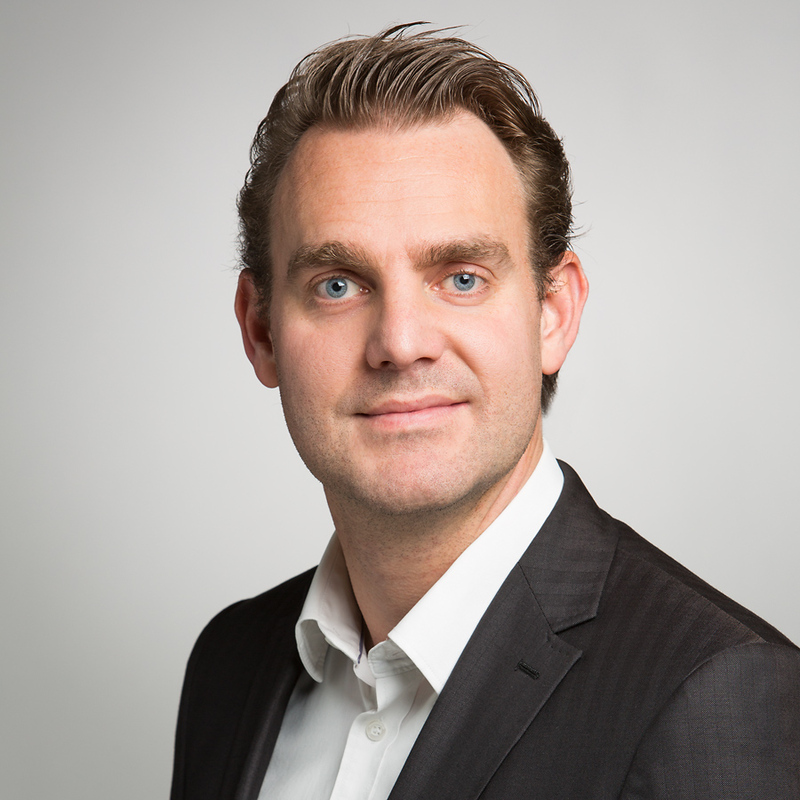 Als u de fout in plaats daarvan wilt classificeren als opnieuw te proberen, voegt u de eigenschap nonRetriableErrorCodes met waarde “-902” toe aan de implementatiedescriptor (dat wil zeggen weblogic-ra.xml). Om automatisch een nieuwe poging te doen stelt u de volgende composite.xml-eigenschappen voor deze aanroep in: jca.retry.interval, jca.retry.count en jca.retry.backoff. Alle eigenschappen zijn gehele getallen. com.bea.wli.sb.transports.jca.JCATransportException: oracle.tip.adapter.sa.api.JCABindingException: oracle.tip.adapter.sa.impl.fw.ext.org.collaxa.thirdparty.apache.wsif.WSIFException: servicebus:/WSDL/EmailService/BusinessService/retrieveMail/retrieveMail [ retrieveMail_ptt::retrieveMail(InputParameters,OutputParameters) ] – WSIF JCA Execute of operation ‘retrieveMail’ failed due to: Fout bij oproep opgeslagen procedure. 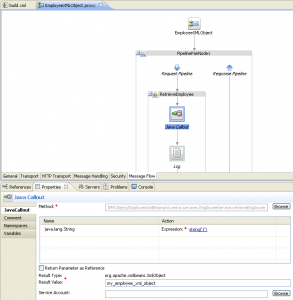 Edwin already blogged about how to refresh the datasources in Weblogic by use of wlst and ant. If you want to refresh the datasource manually in the console do the next. 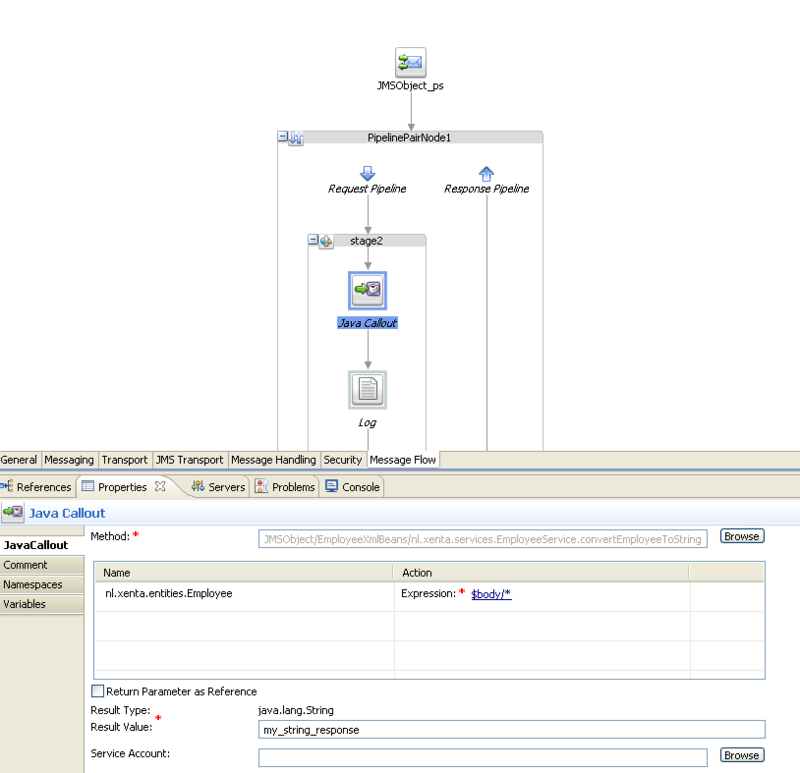 Go to the Weblogic Console > datasources and select your datasource. Go to the tab ‘Control’, select the servers to which the datasource is targetted and click ‘Reset’. Thanks go out to my colleague Arnaud for the tip. For some development task we added a jdbc resource needed for one of our business services which was based on the database adapter. For a test we added environment settings for let’s say development1, but later on we needed to switch this setup to development2. Easy task by just editting the jdbc resource setup in the console, change the settings and go (or restart the server and go). But in both cases the resource kept pointing to the development1 environment. Now navigate to the file mentioned in the descriptor-file-name tag. In here the credentials and connection info are getting stored. This file was for some reason out of sync with the data showed in the Weblogic Console. Delete the jdbc resource from the console, and see if the config.xml and the corresponding file in the jdbc directory are getting removed. Re-add the jdbc resource in the console, and check the file again to see if the correct info is getting stored. Or try the change the settings in the file itself and do a restart.